Notre Dame would like you to believe that the death of Declan Sullivan Wednesday was a tragic accident but an isolated one, a sad case of bad weather conspiring with terrible misfortune. And that would be wrong. I worked for a season in the video department of an FBS football program doing the same job that led to Declan Sullivan's untimely death: filming daily football practices from atop a scissor lift. And I can assure you that the attitude of football programs nationwide when it comes to this equipment is not safety first. On my third day of employment, I received training on how to operate the lift. It was a half-hour course. The guy who owned the machine taught us how to go up and down and how to lower the hydraulic pivots to keep the machine stabilized. This would've been all well and good had the lift been placed on a level plane. But it hadn't been. It was behind the goalposts at the team's practice field, perched on a sidewalk with a pedestrian ramp on the curb. The lift was never on an even surface. From that point on, I spent roughly four mornings a week on that machine filming practice. I was ordered to take the lift as high as it could possibly go every day. It swayed every day. The other fun feature of the end zone lift was that any time the wind blew south, it would blow the field goal net directly underneath me. If I'd come down for any reason, I would've taken the entire field goal net with me, which probably would've led either to my having to pay for repairs to the net (which would've cost more than I made working there) or to my termination. Maybe both. This brings me to the one time I really thought I was going to die on the lift. The coaches decided to hold practice with lightning on the horizon, and when I protested about going up on the lift — because, really, who wouldn't want to spend two hours on a 50-foot-high metal conductor in the middle of a lightning storm? — I was told in no uncertain terms that I had to go up, but that I would be fine because somebody was tracking the lightning strikes in the area, and if a serious danger presented itself, I'd be allowed to come down. 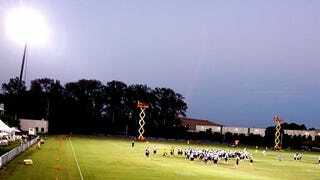 About 30 minutes into that practice, I could see lightning strikes roughly a mile or two away. I called my boss, the video coordinator, and asked to come down. I was told that the lightning wasn't close enough yet. Three minutes later, whoever was tracking the lightning decided the time had come, and the players and coaches ran for cover. The storm was moving south, though, and the winds came with it. I couldn't come down without bringing the entire field goal structure with me (and that's assuming the lift wouldn't have malfunctioned after getting tangled in the net, as it had in the past). So I was stranded alone on a metal lift with nobody in sight and a lightning storm coming right for me. Now, fortunately, the wind let up for a moment, and I was able to get down and run inside to safety, but I never forgave the staff for forcing me up there, and I pretty much resolved then and there that I was done with the program. I stayed on out of loyalty to a friend who had gotten me the job to begin with, and I left immediately after the last game of the season. I bring up my own story to demonstrate that the circumstances that led to Declan Sullivan's death weren't unique. What happened to him could have happened to any one of the many people across the country working that job. And as long as football coaches are the ones making these types of decisions, a certain danger will always be present. A football coach will never turn down an opportunity to practice, especially during a game week. To the best of my recollection, practice was canceled solely due to inclement weather twice during my tenure. And in both cases, it was canceled only because the weather represented a threat to the safety of the players and coaches. The safety of the video staff was an afterthought. To me, the more egregious violation here is that Notre Dame has an indoor practice facility. The program I worked for did not; if they didn't practice outdoors, it was a lost day. Notre Dame could just as easily have practiced inside for a second day, and had they done so, Declan Sullivan would be with us today, and I wouldn't be writing this. But they didn't. Why? I've heard rumors that Brian Kelly doesn't like practicing indoors. I hope they're wrong, because I don't want to believe he'd be so callous as to send somebody up on a lift in those conditions merely for the sake of simulating game-time conditions. Maybe the thought that it was dangerous for the video staff never crossed his mind. If that's the case, he shouldn't the one making that decision, and the decision should belong to somebody who has everybody's best interests in mind, not just Brian Kelly's. Let me make one thing clear: I don't blame Brian Kelly for Declan Sullivan's death. I blame the culture surrounding a football team for his death. There's no way Declan Sullivan wanted to be on that lift. His Facebook/Twitter posts make that crystal clear. But I'm sure he knew there would be negative consequences for him if he refused to go up on that lift. It probably wasn't even an option in his mind. It certainly wasn't for me. I hope the investigation into his death leads to a rigorous set of safety measures that the NCAA will adopt across the board. No more rickety scissor lifts. No more shortcuts. No more cutting corners on safety measures. No more "eh, good enough." The days of college coaches endangering lives for fear of losing a day of practice need to end. I just wish they had ended a day sooner. If any readers have had similar experiences, please send them to tips@deadspin.com, subject "scissor lift."